Crawl space insulation is often overlooked as people don’t often think about it, but crawl spaces are open to the outside weather, and cold can easily seep into the house through the floor. Proper insulation will help keep you warmer, and your utility bills lower. Not only is crawl space insulation important to keep you warm, but it is also important to keep your pipes from freezing. Pipes which burst can cost hundreds of dollars to repair. 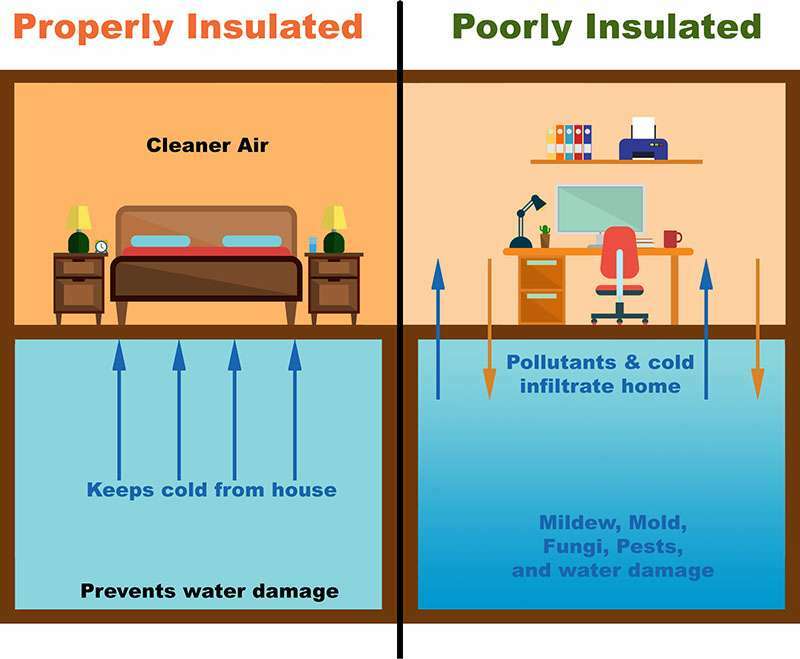 Proper insulation also protects your floor from moisture which causes mildew, fungi, mold, and wood rot. Crawl spaces are typically filled with dirt, and that means that there are all sorts of pollutants, such as dust, allergens, and rodents, which can seep into your home. An insulted crawl space will keep your air quality at home cleaner. Schedule a FREE No Obligation Crawl Space Estimate Today! Don't neglect your crawl space! Most crawl spaces are moist, dark places. Located underground, they can bring on some unfortunate issues that ultimately affect the heating and cooling efficiency of your home. They may be out of sight, out of mind but it’s extremely important to take care of these hidden spaces for your health and comfort. What happens when crawl spaces are neglected? Crawl spaces are dark, dank, musty, and often times moist. Because they are underground, crawl spaces are a natural breeding zone for the following unpleasantries when neglected. Almost always present in crawl spaces, no matter how old or new your home is. Dirt can act like a sponge when it comes to holding moisture. To shield exposed dirt from moisture, installing a vapor barrier is the first step in eradicating the negative side effects. If your home has HVAC piping or ducts in the crawl space, they most certainly will distribute dust and dirt throughout your home unless the ducts and properly sealed. No matter the time of year, crawl space moisture can appear from sources such as standing water, running water or water moisture evaporations from floors and walls. Especially in areas with high humidity and areas that are prone to flooding, moisture is even more of a threat. Any moisture buildup in your crawl space will almost certainly create mold. Not only is mold detrimental to your health but it has the potential to rot structural elements and create serious hazards with the air you breathe. If the crawl space is closed off from your home, conditioned air can flow steadily between the two spaces under the right conditions. And while venting your crawl space can aid in deterring the smell, the right variance in humidity between indoors and out forces moisture to evaporate upwards through the ceiling and into your home..
Not always the kind of pets you want in your home, these LOVE dark, moist spaces. Unfortunately, they’re not dormant down there just ‘existing’ and creeping around. Any vapor barriers, old insulation or ductwork can easily be damaged by termites, rats and insects. They are using these areas as their homes, which results in their bodily residue in the air flowing through any poorly-sealed ductwork. You’re breathing that all in – Yuck! A nightmare for allergy and asthma sufferers.